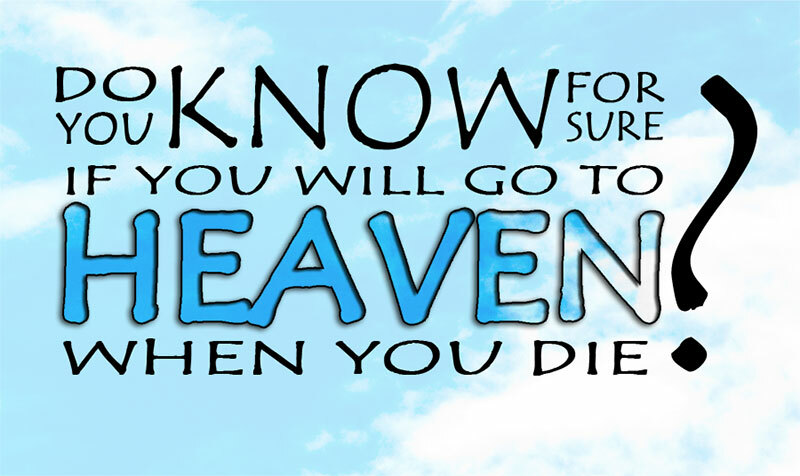 Can we be sure of going to Heaven? Have they? How do we know? And isn’t it arrogant or at least presumptuous to assume that a person (or that we ourselves) will definitely go to Heaven? If entrance into Heaven was based on what we do, like loving our neighbors, or not stealing or being faithful, then yes it would be arrogant. It would be saying I’ve made it! I’m good enough. But all of us fall way short of God’s standards, so how can anyone be sure of going to Heaven? The Apostle John says I write these things to you who believe…so you may KNOW that you have eternal life (1 John 5:13) What did John write in order to give us this assurance? He tells us God has given us eternal life, and this life is in His Son. (vs 11) Our confidence is not based in what we do – it’s entirely based on what God has done for us through Jesus. He loves us so much that He gave His own Son to die on a cruel cross to take the punishment that we deserve. What do we need to do to receive this gift? Trust Him! Trust Him and what He has done for us. We accept this gift of eternal life through faith in Him. And we cannot boast about a gift. Actually it takes humility to recognize that we cannot get to Heaven by what we do. The only way is to trust Him to take us there. Have you believed? Do you have that assurance?